Something to please everyone! Rougemont juices are made from a variety of apples, as well as other fruit juices for our delicious cocktails. Water, sugar/glucose-fructose, concentrated (apple and/or grape (sulfites), pomegranate, blackberry, cherry, raspberry) juices, citric acid, natural and artificial flavours, vitamin C, colour. Water, sugar/glucose-fructose, concentrated (apple and/or pear and/or grape (sulfites), peach) juices, citric acid, natural and artificial flavours, sodium citrate, colour. Water, sugar/glucose-fructose, concentrated orange juice, citric acid, natural flavour, vitamin C, colour. 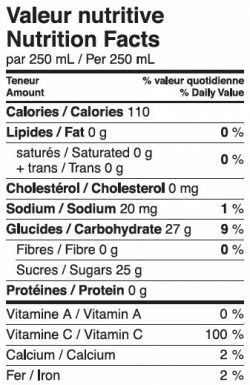 Water, sugar/glucose-fructose, concentrated (apple and/or grape (sulfites), peach, mango) juices, citric acid, natural and artificial flavours, modified corn starch, vitamin C, colour. Apple juice from concentrate (water, concentrated apple juice), apple juice not from concentrate, vitamin C.
Water, sugar/glucose-fructose, concentrated (apple and/or pear and/or grape (sulfites), lemon, lime) juices, citric acid, modified corn starch, sodium citrate, natural and artificial flavours, colour. 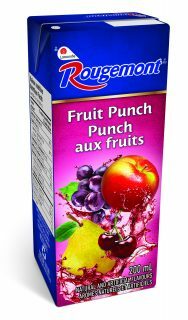 Apple juice from concentrate (water, concentrated apple juice), vitamin C.
Fruit juice from concentrate (water, concentrated apple and/or pear and/or grape (sulfites), raspberry, concord grape, blueberry juices), natural flavour, concentrated purple carrot, citric acid, vitamin C.
Apple juice not from concentrate, vitamin C.
Water, sugar/glucose-fructose, concentrated (apple and/or pear and/or grape (sulfites)) juices, citric acid, sodium citrate, natural and artificial flavours, colour.